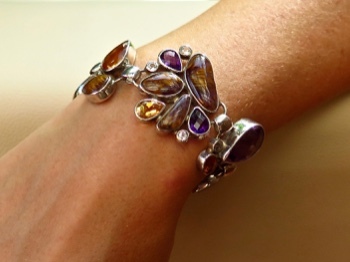 What an amazing and exotic creation. 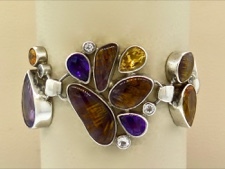 This asymmetrical design features Amethyst, Cacoxenite in Amethyst, Citrine, and White Topaz set in sterling silver bezels and combined with sterling links. 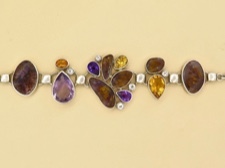 The deep yellow citrine draws out the golden inclusions of cacoxenite in the amethyst cabochons. Definitely one of a kind! 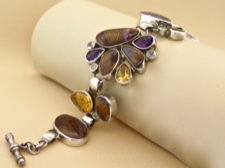 This bracelet closes with a sterling toggle at 6.5, 7, or 7.5 inches.